Come November, farm animals will be front and center on the ballot. Proposition 2, also known as the Prevention of Farm Animal Cruelty Act, would outlaw veal cages, pig gestation crates, and battery cages used to hold egg-laying hens throughout California. If passed, all farms would have to be cage-free by 2015, and violators would face fines not to exceed $1,000 and/or the possibility of jail time. A statewide proposition aimed at preventing animal cruelty is generating dire warnings from a group that fears egg production could vanish from California. Dubbing Proposition 2 the “un-SAFE food initiative,” members of Californians for SAFE Food say that passage of the act would be detrimental to the state’s farming industry. “Proposition 2, quite simply, is an un-SAFE food initiative. It undermines California’s current high food safety standards, putting us at greater risk with exposure to illness and disease like salmonella and bird flu,” Julie Buckner, spokeswoman for the “NO on Prop 2” campaign, said in a press release. “While the proponents claim the measure is ‘moderate,’ it is really a wide-sweeping, risky, and dangerous measure that will have costly, negative consequences for California,” Buckner said. However, organizations supporting the proposition have rebuked the coalition’s stance as unfounded and ill informed. According to www.humanecalifornia.org, the Web site of the Californians for Humane Farms campaign, the regulations suggested in the legislation are “modest measures” meant to prevent cruel and inhumane practices toward animals. At the heart of the disagreement is an economic impact study released earlier this month by the University of California at Davis that suggests Proposition 2 would likely force the state’s $300-million egg industry to move out of the state. According to the report’s findings, the passage of Proposition 2 would virtually eliminate the current practice of confining laying hens to small cages, thus raising the cost of production by 20 percent or more and requiring the industry to invest hundreds of million of dollars in new housing for chickens. This change, according to the report, would most likely not affect the price of eggs, but it would affect egg production in California. “The UC Davis study fails to take into proper account the potential future for eggs laid by hens that are not confined to inhumane cages,” Fearing told the Sun in an interview. For example, Fearing said, similar predictions were made for a ballot initiative in Arizona, banning the practice of confining pregnant pigs to small crates or stalls, but passage of the initiative helped trigger widespread farming reform. Also, Fearing criticized Californians for SAFE Food’s claim that passage of Proposition 2 would lead to the outsourcing of egg production to other countries, such as Mexico. California currently ships approximately 50 percent of its eggs from other states, such as Iowa and Texas. Joy Mench, a fellow UC Davis professor who helped in the study and director of the Center for Animal Welfare, said that she agreed with Sumner’s findings. But there is a compromise, she explained. Mench favors the more humane, European-inspired “furnished cage,” or a cage equipped with a nest box, perch, and area where the birds can clean their feathers. “But as I understand it, the wording of the California legislation would ban those types of cages as well,” she said. Originally, Mench said the language of the proposition was so general that it most likely would eliminate cages altogether. However, the cages don’t have a completely negative impact on the hens because they can help limit the spread of disease, she said. The California court system found the language significantly limiting as well. A court-ordered, revised summary prepared by the State Attorney General’s office says Proposition 2 would “require certain farm animals be allowed, for the majority of every day, to fully extend their limbs or wings, lie down, stand up, and turn around. Limited exceptions apply. Locally, the impact would most likely be less severe, according to several experts in the agricultural industry. Santa Maria-based Rosemary Farm is the only egg-processing farm in the county but, according to Santa Barbara County Agricultural Commissioner Bill Gillette, the farm no longer houses chickens so it wouldn’t have to significantly update its facilities if the measure were to pass. As of press time, calls made to Rosemary Farm were not returned. 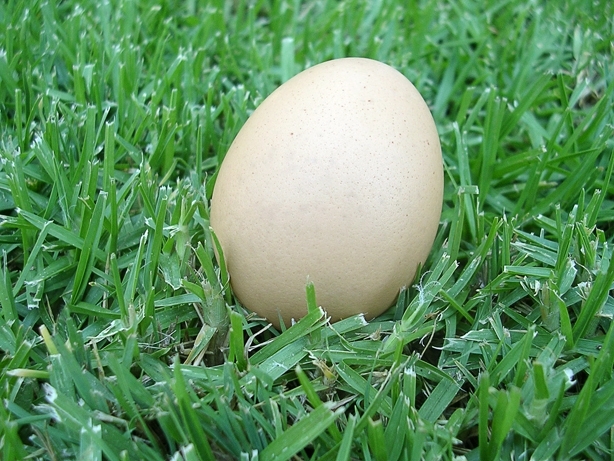 At Cal Poly, San Luis Obispo, however, egg production would have to undergo fairly drastic changes. Also, the center would convert to cage-free production using existing facilities, Soderstrom said. Currently, the program has about 14,000 chickens, and processes more than 3.3 million eggs a year. Cal Poly eggs are sold in grocery stores around the Central Coast, and in the school’s Campus Market. According to the Cal Poly College of Agriculture, Cal Poly Eggs is an Enterprise Project, meaning that it’s university-funded. However, the size and sales generated by the project have enabled the college’s poultry program to be largely self-funded. Profits from egg sales are used to buy supplies and equipment, and to support students, who gain work experience in the commercial egg industry. For more information about Proposition 2 and other initiatives slated for the November ballot, visit www.sos.ca.gov/elections/.